From coast to coast and in middle America, more sensible parking policies are taking hold and may be the quickest path to urban revitalization. 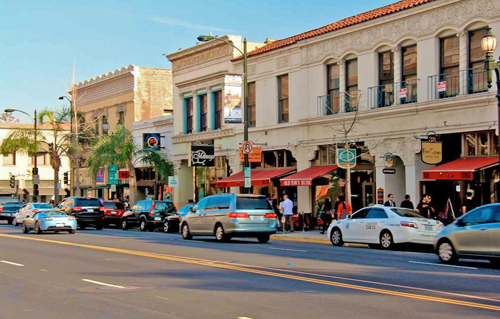 Downtown Pasadena was revitalized through taking a different approach to parking. Parking is one of the primary shapers of US communities, and has been for a century. The walkability of a city or town is often determined by how much parking dominates the public realm. New urbanists promoted design solutions to reduce the impact of parking on public spaces and ideas like “park once” and shared parking to create better urban places. Like-minded innovators have taken reform to new levels through market-based parking strategies that allow urban places to flourish. Public Square editor Robert Steuteville interviewed Donald Shoup, UCLA professor and author of The High Cost of Free Parking, and Jeffrey Tumlin, director of strategy for Nelson\Nygaard Consulting Associates, transportation planners and engineers, on how new ways of thinking about parking are transforming the American landscape. The Charter of the New Urbanism says that streets should be framed by architecture and landscape design. How does parking help or hinder that concept? Shoup: It depends. On-street parking provides a barrier between the sidewalk and moving traffic. If treated well, curb parking is not the evil that many people think it is. Street trees planted in the parking lane between cars can add to the overall aesthetic of a street. Palo Alto (California) has a very good example of that. On its main street, there’ll be two parking spots and then a street tree with a semi-circular curb to protect it from the cars. There are negatives, especially where parking is placed between the sidewalk and the front of a building so that when you’re walking along the street, you see a parking lot between you and the front of the store and it’s clear that the real customers of the store are drivers, not pedestrians. One of the things that New Urbanism has definitely got right is the park-once strategy. With municipal parking structures, people can park in one location, and then walk around for as long as they’re in the district. That’s very different from what most cities require, which is usually that every building has to have its own parking on-site. If you go to a restaurant or a store, you can park in their lot. But once you’ve left, they want you out of their lot and so you have to move your car to your next destination. Park-once structures alleviate this problem, but the structures should be placed behind—not on—the main street. The quality of the off street parking matters too. Wrap the parking structure with active uses, a thin layer of offices, or apartments so that when you walk down the street it doesn’t look like the typical concrete-block parking garage. These are the aesthetics of parking. How has parking affected the walkability and the livability of cities and towns over the last five or six decades? Tumlin: Let us celebrate parking for a moment, and how parking drove the marketability of the suburbs. It’s easy as urbanists to underestimate the appeal of suburbia, not only today but particularly as it was being invented in the post-war era. The idea of limitless personal mobility is incredibly alluring. The ability to park, in part, drove the invention of a new lifestyle. The mistake that we made was trying to apply the concept of the suburban dream on certain urban places. That we put a one-size-fits-all approach to the automobile and to automobile parking in both contexts, that was the failure. A one-time simple solution for almost any urban planning need fails either the city or the suburbs. Shoup: I’d be a bit more critical. My main criticism does not concern parking itself but parking requirements. I’m not against cars and I’m not against parking. I’m against off-street parking requirements in zoning ordinances which I think have led to pedestrian-free zones in cities. Consider three urban policies to stimulate the demand for cars and fuel. First, separate different land uses. Housing here, jobs there and stores somewhere else. Second, limit density so you have to travel a distance to get from your house to your job and to a store. Third, require ample free parking everywhere, so cars become the natural way to travel everywhere. Free parking in particular enables car travel. With these three policies, cities have reduced the cost of driving and raised the price of everything else to pay for it. It makes the city more drivable but less walkable. I think it’s foolish to say that without parking requirements we won’t have any parking. If you ask any developer whether they would exclude parking if it wasn’t required, they would respond, “That’s ridiculous.” If drivers paid for the cost to provide parking, we would use cars more rationally. Tumlin: It’s also important to look at who had a lot of money to make building the suburban dream. There was broad agreement by the institutions that fund the construction of these places, including all of the conventional real estate finance industry, that minimum parking requirements were a good idea and they still demand a 1970s level of parking regardless of context. How has the thinking on parking in cities and towns changed in the recent decade or two? Tumlin: Every place that bought into this 1970s parking concept has recognized that it has completely failed them. So it’s become relatively easy to go into a place to help them retool their regulations for the needs of 2020. Even in suburban contexts. We’re working with Mountain View, California, which has realized that their minimum parking requirements were literally driving their traffic congestion problem. Not only has Mountain View been eliminating minimum parking requirements, but it has established very low parking maximums for its suburban office parks as a traffic control mechanism and as a housing affordability tool. Similarly, Mountain View has required that the price of parking be unbundled from the price of not only housing but also commercial leases. They require that new parking be largely shared with other land uses and not restrictive. They’re also encouraging that parking be priced, which is pretty radical in a suburban context. Mountain View has realized that parking regulations are a tool for creating specific outcomes, like all regulations. And they’ve realized that a conventional approach to parking regulations was creating only bad outcomes. Shoup: Planning consultants, like Nelson\Nygaard, have spread the better ideas about parking. Nowadays, consultants have much more to tell cities about how parking affects the city, the economy, and the environment. Cities guided by these firms are looking for successful examples like Mountain View. Expertise has been developed from the successful outcomes of the recent decades. The planners of the 1950s didn’t impose minimum parking requirements on an unwilling public, they simply gave a veneer of professional expertise to parking requirements. But that expertise really didn’t exist. A little over a decade ago, a very big book called The High Cost of Free Parking came out. Don, did you expect this book to have such an impact? How has it changed the conversation? Shoup: When the book came out, half the planning profession thought I was crazy and the other half thought I was daydreaming. Now planners are beginning to think that the ideas were practical and sensible. I can boil the 800 pages down to three bullet points. First, charge the right price for curb parking so there are always one or two open spaces on every block. Second, spend that revenue to pay for added public services on the metered blocks so that the stakeholders benefit from these metered spots. Some cities use the money to provide free wi-fi to everybody on the street. They pressure wash the sidewalks frequently, plant new street trees, and remove graffiti every night. Investing the money back into the metered street creates the political will to charge the right price for on-street parking. And third, remove off-street parking requirements because nobody can say there’s a shortage of parking if drivers can always see one or two empty spaces on every block. Removing off-street parking requirements can have a big effect, even in the short run, because it allows the adaptive re-use of older buildings. Did that book change your practice, Jeff? Tumlin: Don’s ideas very much influenced my career and shaped my practice at Stanford University. When the book came out, we felt we could be bolder in our messaging about aligning community values with regulations and clear about the outcomes we were seeking with our regulations. Can either of you talk about any cool projects that are happening right now in cities or towns that involve parking? 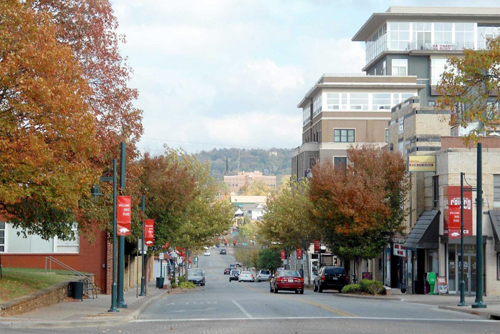 Tumlin: I love that cities like Fayetteville, Arkansas, are eliminating all minimum parking requirements. I love that these conversations are happening at every urban scale. That this is not just a coastal phenomenon or urban phenomenon. Everyone has started to recognize the problem, from the design professions to the academics to municipal leadership and even traffic engineers and the financial sector. Specifically, I applaud the work that Seattle did. It used an immense amount of data to help manage parking better through building the right price. Seattle took all of San Francisco’s lessons and did the exact same thing, but using its own resources on the cheap and came up with some simple formulas for being able to convert the data that they already had at their parking meters to get their own price right. They were able to spread those concepts far more rapidly than San Francisco, in part because they’ve gotten the messaging right with their own business community and residents. Shoup: The San Francisco experiment, called SF Park, started in 2011 to adjust parking prices in response to parking demand. It is run by some of the most dedicated, hard-working, and talented public servants I had ever met. Other cities including Boston, Berkeley, Los Angeles, Oakland, Seattle, and Washington DC have started rolling out similar programs. Buffalo eliminated all minimum parking requirements so now their regulation only reads ‘No off-street parking is required for any land use.’ Setting a maximum number of spaces is nice, but the key thing is remove the minimum requirement. Tumlin: After it eliminated the urban parking minimum and established maximums, San Francisco has changed its approach to transportation impact analysis for new developments. It no longer looks at intersection level of service but instead looks at how many vehicle trips the project generates, measured largely by parking supply. A giant office building in downtown San Francisco that has zero parking limits, it may generate vehicle trips. But because the parking supply downtown is constrained, any new vehicle trips their project generates may end up displacing existing vehicle trips, so the net impact is zero. If a project wants to build parking in San Francisco, it’s now required to mitigate its impact on traffic by implementing increasingly tough transportation demand management requirements in exchange for the privilege of building parking. Similarly in Mountain View, when the city eliminated its minimums in the office park area, it established a relatively generous maximum at 2.4 spaces per thousand. But if a project is going to build that many parking spaces, it also needs to demonstrate how it’s going to comply with the vehicle trip cap that the city also imposes and ensure that the parking supply matches the intended vehicle trip generation rates. We see parking lots being filled in with buildings downtown. I see this in almost in every city in America. But what about the suburbs? There’s still a lot of free parking in the suburbs, still a lot of parking lots everywhere you see. Are these ideas having an impact outside of cities in the wider metro area? Tumlin: Mountain View is an extremely suburban place and where they’ve been messing with parking, it’s an area that is historically one and two-storey office buildings surrounded by seas of free surface parking. The city of South San Francisco, another suburban office park area, has done similar things for Genentech. They’ve allowed Genentech to put buildings on existing surface parking. They haven’t replaced the parking but instead have invested the money that it would have spent on parking structures on free shuttle services for their employees and paying them not to drive. Increasingly in small-town downtowns, Petaluma (CA) for example, municipalities are deciding that they already have enough parking and they’ve begun to discourage all new development from building parking in order to meet the walkability goals that support a real small-town main street environment. Shoup: There’s a new trend toward converting private parking lots attached to stores into paid public lots. A parking operator enters into an agreement with the owner of the parking lot and proposes that they operate it as a public lot with meters and they split the revenue, but customers can park free. So instead of having empty spaces that yield no income, the owner converts the lot into shared, paid parking so that anybody can use it as a park-once operation. Tumlin: That’s exactly what little downtown Truckee, California, is doing as well with its downtown extension. It’s asking that the grocery store and the new performing arts center provide a shared parking pool for all of the surrounding commercial areas, so that they can also maintain a walkable downtown that is a park-once environment. Transportation is changing significantly. There’s Uber, Lyft, and other carshares, but there are also automated vehicles on the horizon. How do you see this affecting parking? Tumlin: In San Francisco, Uber and Lyft have had a significant impact on urban parking demands. Within San Francisco, it’s always cheaper to take UberPool or Lyft Lines downtown than it is to drive and park there. This is a very hot topic right now for pretty much all of our developer and municipal clients. How should we approach the parking components, a 40-year asset, knowing that at most it’s going to have a 10- to 20-year use life? How much parking should we build now, and what do we do with this parking once it’s no longer needed? Do we build parking now in ways that allows the building to be adaptable to different uses? One developer has encouraged high ceiling heights and double floors in parking structures to encourage adaptability. Shoup: Uber and Lyft know very well that the highest demand for their services are in areas where the price of parking is high. Therefore, they have often asked me about minimum parking requirements. They realize that minimum parking requirements reduce the demand for transportation network companies (TNCs). If you’d like to see shared automated vehicles succeed, the best way to do this is to reform off-street parking requirements. Removing off-street parking requirements will create much more demand for TNCs and automated vehicles. So it isn’t just that these automated vehicles are going to affect parking, but parking affects how fast these automated vehicles will be introduced. Are you seeing improved urban places because people are thinking better or differently about parking? Right now, is this happening in cities all around the country? Shoup: Old Pasadena probably provides the best example. It was a commercial skid row in the 1970s and now it’s one of the most popular destinations in southern California. That change occurred because Pasadena effectively removed off street parking requirements, installed parking meters, and spent the revenue for added public services. Parking yields over a million dollars a year for a small business district and they have made it immaculate. On a typical weekend, 30,000 people go there just to walk around. All ages, genders, everything. It’s very peaceful with lots of restaurants, and all kinds of people are earning a living where the buildings were previously empty above the ground floor. I can’t point to a more astonishingly dramatic change than Old Pasadena. Tumlin: Don’s research on Old Pasadena is one of the seminal pieces of research in our field and we still point to it. In every city that has eliminated its minimum parking requirement, I’ve observed the way in which opportunities for developing little, small infill parcels becomes completely unlocked. Every place from downtown Petaluma, to downtown Santa Monica, to scattered, otherwise completely undevelopable parcels in San Francisco. And now, increasingly, in places like Oakland—which has significantly eliminated minimum parking requirements in the urban parts of the city—are seeing development pencil in a way that would have never been possible before because it was physically impossible, or financially very expensive to meet the minimum parking requirement. The end result is a greater concentration of activity, of retail, of people living downtown that make it much more interesting. Downtowns can now attract better restaurants, more shopping, grocery stores and all the things that otherwise also wouldn’t have been able to come there because there simply weren’t enough people. Note: CNU intern Benjamin Crowther helped to produce this interview and article. Robert is editor and publisher of New Urban News, a newsletter for professionals, public officials, and citizens interested in the New Urbanism and neo-traditional development.